Mr. Brokaw, who retired as anchor in 2004 and currently serves as a special correspondent for NBC, had nonchalantly said that Hispanics should make a greater effort to blend into American culture. His comments, made during a discussion about President Trump’s desired border wall, led to an immediate backlash. Yamiche Alcindor, the White House correspondent for “PBS NewsHour” and a former New York Times reporter, was also on the panel and responded to Mr. Brokaw’s comments. “You’re talking about assimilation. I grew up in Miami, where people speak Spanish, but their kids speak English. And the idea that we think Americans can only speak English, as if Spanish and other languages wasn’t always part of America, is, in some ways, troubling,” Ms. Alcindor said. Among those who criticized Mr. Brokaw was Representative Joaquin Castro, Democrat of Texas. He explained in a Twitter thread that even though there are generations of Hispanics in the United States, they are, in his opinion, never truly considered American. The National Association of Hispanic Journalists reprehended Mr. Brokaw in a statement released on Sunday. “Brokaw’s comments also ignore the fact that most U.S. Hispanics are born in the United States; English is their native language,” the statement read. The organization also criticized him for what it viewed as an insufficient apology. In a 2016 national survey of Latinos, Pew found that 41 percent of Hispanic adults between the ages of 18 and 35 use English as their dominant language. The study found that 40 percent of Hispanics in the same age group are also bilingual. Another Pew study found that Americans with Hispanic ancestry are less likely to identify as Hispanic as generations go on. By the third generation, the share that self-identifies as Hispanic falls to 77 percent. Mr. Brokaw opened his commentary by claiming that the “Republican side” does not want their children to marry Hispanics. One of former President George H.W. Bush’s grandchildren took offense to the “brown babies” comment. “With all due respect @Tombrokaw I am one of those ‘little brown ones’ and can assure you that my grandparents conveyed to me that they loved and were proud of me before they passed,” tweeted George P. Bush, the Texas land commissioner and a son of former Gov. Jeb Bush of Florida. Mr. Bush and his two siblings, who are Mexican-American, were once famously referred to as “the little brown ones” by their late grandfather, who claimed to use the term affectionately. 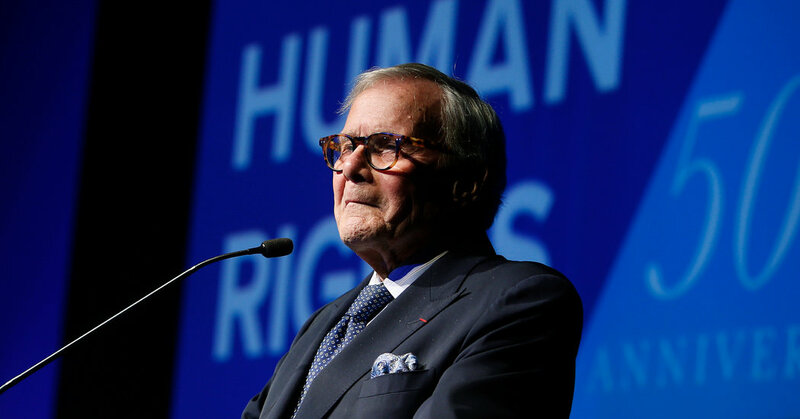 As the anchor of “Nightly News,” Mr. Brokaw was the face of NBC for more than 20 years. Since he stepped down in 2004, he has appeared on the network’s news shows, most often to discuss politics, elections and historical events. Mr. Brokaw has also produced and directed documentaries and special segments. “Finally, I am sorry I failed to convey my strong belief that diversity, dynamic and inclusive, is what makes America,” he said.